﻿ Japanese used parts online shop. 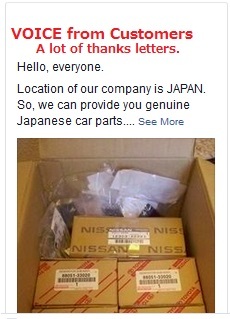 Supply Vehicle Spares from Japan. Search for Free the Japan's largest database of new & spare parts suppliers, to find the lowest prices in the country Receive no-obligation deals quotes within minutes via email or telephone. Buy quality guaranteed new and spare parts at lowest deal prices. Delivered direct to your door. Get your parts delivered fast !